October 17, 2013. Title: Manneken Pis Description: The small bronze fountain sculpture in Brussels, Belgium, depicts a naked little boy urinating into the fountain's basin. Stats: 4,947 views, 1 fav. 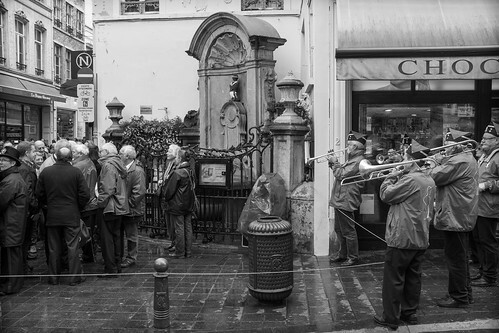 Tags: fuji, X100S, Europe, Brussels, Belgium, Manneken Pis, pee, boy, Black and White, sculpture, fountain, attraction, tourist. Groups: Fuji x100s, Fuji X100s B&W, Digital Black and White. I was recently looking at my Flickr stats and thought it would be interesting to take a closer look at my top ten most viewed photographs and see what, if anything, I could learn about them or learn about Flickr. First, let's look at my stats. I've been a member since 2008 and posted 661 photos that have been viewed 172,321 times. I currently follow 123 photographers and have 105 following me. December 24, 2013. Title: Santa Claus Description: Hope that the Long Island Railroad guides him home safely tonight. Merry Christmas! 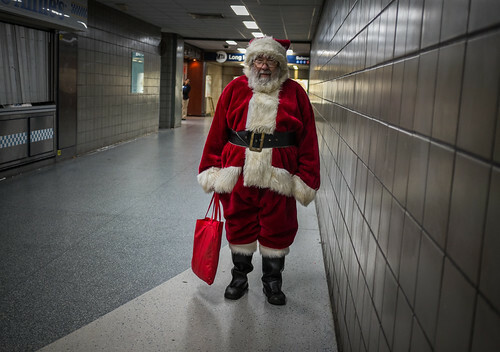 Stats: 3,709 views, 31 faves, 1 comment Tags: fuji, X100S, Santa Claus, Penn Station, New York City, Christmas, holiday, St. Nick, NYC. Groups: Fuji x100s, New York Photography, The Candid Frame, in explore. 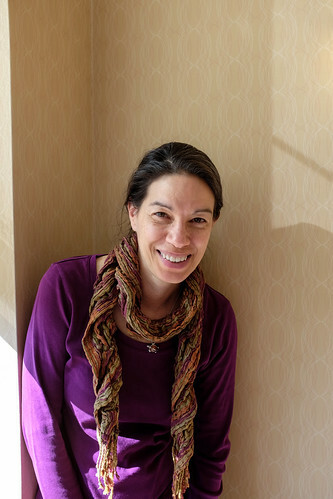 In part one of this two-part post, I share the top five along with relevant information about each photo and try to see if I can understand why these photos rose to the top. The number one photo, Mannekin Pis, with over one thousand more views than the number two photograph, is somewhat of a mystery to me. First, I don't think it is a particularly remarkable photo although I do like it, but is it a 1000 times more remarkable than any other photo on my page. My only guess on why this is at the top has to do with tags. And if this is the case and you go back and read the tags under the photo you might be a little disturbed. Unintentional on my part, but who knows what people are searching for. Also, having been to Belguim a half dozen times in the past three years, I know that there is always a crowd around this site, so maybe it has nothing to do with specific tags. June 1, 2013. Title: Stairwell Portrait Description: Fuji X100S portrait taken in the stairwell of the Marriott Residence inn in Mississagua, Ontario. Stats: 3,074 views Tags: blog.jfpwhoto.com, Toronto, Ontario, Canada, portrait, light, mississagua. Groups: None. The number two photo is one that I do like and is currently featured on my website. It also was featured in Explore on Flickr which I'm sure added to the total number of views, especially if everyone who received a new digital device on Christmas morning was browsing Flickr. September 14, 2013. 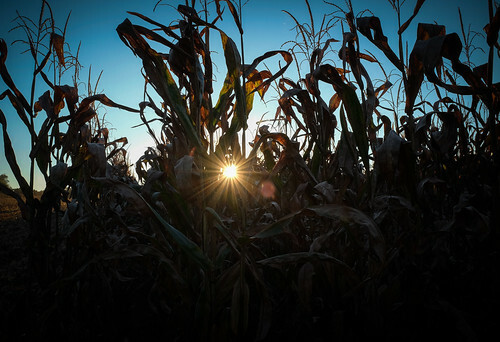 Title: Cornfield Description: None Stats: 2,656 views, 48 faves, 4 comments Tags: Kentwood Park, Md., USA, Delaware Bay, Chesapeake Bay, Bridge, light, Lens Flare. Groups: None. At number four is a photo titled Cornfield and it is one that I didn't even upload until I happened to see the Flickr blog post with the theme of starbursts and remembered that I had taken this photo earlier that year. I posted the photo and it was picked up by Flickr and featured, which explains the number of views, despite no description and not being shared with any groups. 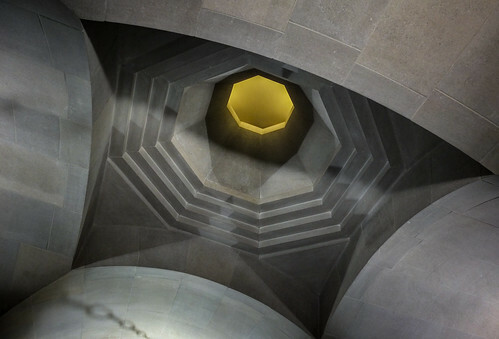 And like the first photo, I don't think the fifth most viewed photo, the ceiling of the Armenian Classroom taken during a visit to the University of Pittsburgh for my son's graduation, is all that great. It could be the title, or detailed description that helps people find this photo. April 28, 2013. Title: Armenian Classroom Description: The ceiling of the Armenian Classroom located in the University of Pittsburgh's Cathedral of Learning. The Nationality Rooms are located on the first and third floors and were designed to represent the culture of various ethnic groups that settled in Allegheny County and are supported by these cultural groups and governments. Stats: 2,543 views, 4 faves, 3 comments Tags: Pittsburgh, Pa. USA, Armenian Classroom, University of Pittsburgh, Cathedral of Learning. Groups: Fuji X10, X20 and X30, Fujifilm X10, digital compact only -- p1 / a2 -- open EXIF --. If you are on Flickr, check your stats which can be accessed in the drop-down menu under You at the top of the page. In Part II of this blog post, I'll share number five through ten.